This book explores Europe's 'long nineteenth century', from the French Revolution in 1789 until the outbreak of the First World War in 1914. Telling the story of how Europeans entered politics in the fiery trials of revolution and industrialization, the account opens with the French Revolution, passes through the crucible of the 1848 Revolutions and ends with the emergence of mass movements - socialist, revolutionary, nationalist and authoritarian - which anticipated those of the twentieth century. 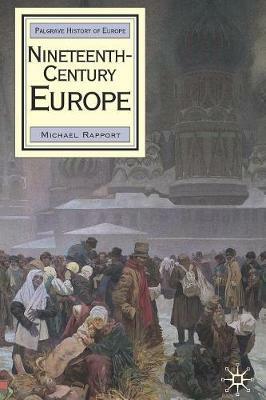 Along the way, Michael Rapport describes how people experienced the changes which affected European society, including: - poverty and living conditions - the abolition of serfdom (particularly in Russia) - the changing status and role of women - the expansion of education and literacy - the growth of popular culture. Rapport also considers international developments such as: - warfare - the unifications of Italy and Germany - the emergence of new states in the Balkans - the origins of the First World War - European imperialism across the globe. Paying attention to all of the major powers, but also to others, particularly Spain, Italy and the Balkan states, this is an ideal introduction for all those interested in the history of Europe in the nineteenth century.